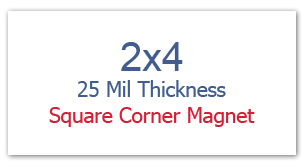 Custom 2x4 inch custom printed square corner full color magnets – 25 mil makes a good marketing choice for advertisers who are eyeing long term business benefits from one time investment. A logo imprinted promotional 2x4 inch square corner full color magnet can be handed out during social soirees, and other promotional events, where huge turnouts can be expected. Cosmetically enhanced customized 2x4 inch printed square corner full color magnets stand higher chances of retention than their regular service life of 8 months 1.5 yr because they make a wonderful refrigerator art. Newbie advertisers or those who wish to position themselves deeply into customer’s consciousness can derive benefits by investing in this magnet. Product Size : 2 in. x 4 in.